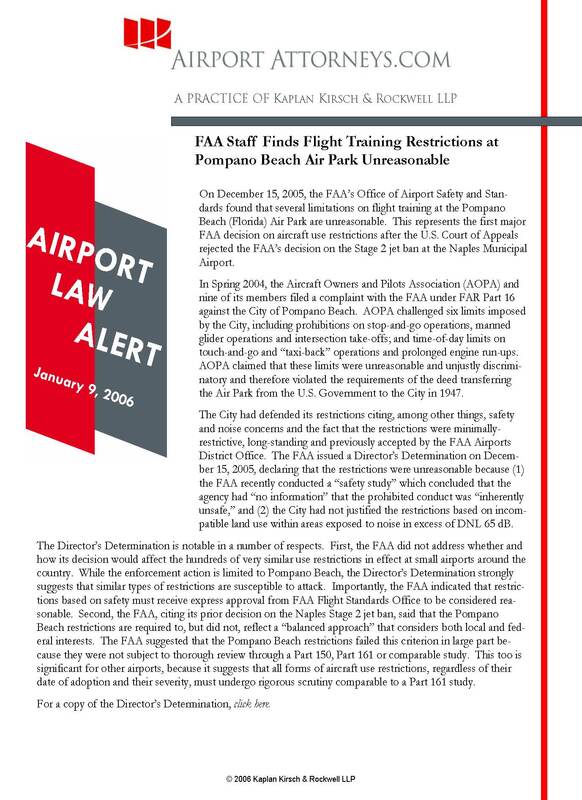 On December 15, 2005, the FAA’s Office of Airport Safety and Standards found that several limitations on flight training at the Pompano Beach (Florida) Air Park are unreasonable. This represents the first major FAA decision on aircraft use restrictions after the U.S. Court of Appeals rejected the FAA’s decision on the Stage 2 jet ban at the Naples Municipal Airport. In Spring 2004, the Aircraft Owners and Pilots Association (AOPA) and nine of its members filed a complaint with the FAA under FAR Part 16 against the City of Pompano Beach. AOPA challenged six limits imposed by the City, including prohibitions on stop-and-go operations, manned glider operations and intersection take-offs; and time-of-day limits on touch-and-go and “taxi-back” operations and prolonged engine run-ups. AOPA claimed that these limits were unreasonable and unjustly discriminatory and therefore violated the requirements of the deed transferring the Air Park from the U.S. Government to the City in 1947. The City had defended its restrictions citing, among other things, safety and noise concerns and the fact that the restrictions were minimally restrictive, long-standing and previously accepted by the FAA Airports District Office. The FAA issued a Director’s Determination on December 15, 2005, declaring that the restrictions were unreasonable because (1) the FAA recently conducted a “safety study” which concluded that the agency had “no information” that the prohibited conduct was “inherently unsafe,” and (2) the City had not justified the restrictions based on incompatible land use within areas exposed to noise in excess of DNL 65 dB. The Director’s Determination is notable in a number of respects. First, the FAA did not address whether and how its decision would affect the hundreds of very similar use restrictions in effect at small airports around the country. While the enforcement action is limited to Pompano Beach, the Director’s Determination strongly suggests that similar types of restrictions are susceptible to attack. Importantly, the FAA indicated that restrictions based on safety must receive express approval from FAA Flight Standards Office to be considered reasonable. Second, the FAA, citing its prior decision on the Naples Stage 2 jet ban, said that the Pompano Beach restrictions are required to, but did not, reflect a “balanced approach” that considers both local and federal interests. The FAA suggested that the Pompano Beach restrictions failed this criterion in large part because they were not subject to thorough review through a Part 150, Part 161 or comparable study. This too is significant for other airports, because it suggests that all forms of aircraft use restrictions, regardless of their date of adoption and their severity, must undergo rigorous scrutiny comparable to a Part 161 study. In mid-January 2006, the City of Los Angeles and surrounding communities are scheduled to finalize an agreement that will allow parts of the LAX Master Plan to proceed. The LAX Master Plan was approved by the FAA in May 2005 and contains massive changes for LAX, including reconfiguring the airfield; reconfiguring the midfield terminals; and constructing a new intermodal transportation center, ground transportation center, consolidated rental car facility, and automated people mover system. The Master Plan is designed to accommodate 79 million annual passengers by 2015. The approved Master Plan was the result of many years of planning and environmental review. The Master Plan also has been the subject of intense controversy and has been challenged by the County of Los Angeles, El Segundo, Culver City, and the Alliance for Regional Solution to Airport Congestion (ARSAC). The proposed agreement between Los Angeles and these communities would resolve the outstanding litigation and allow Los Angeles to begin work on the first phase of the Master Plan. As part of the agreement, Los Angeles will discontinue using 10 of its existing passenger gates, at a rate of two gates per year starting in 2010. This is perhaps the most legally significant aspect of the agreement because it may constitute a limit or restriction on airport activity. The FAA explicitly approved this element, finding that its burden would be offset by the benefits conferred by the agreement. This represents only the second time in recent years that the FAA has accepted this kind of trade-off in an airport expansion project; the first involved a new runway at Boston-Logan Airport. It may be the first instance in history in which the FAA expressly has approved a reduction in the number of gates at an airport intended to control passenger traffic. Los Angeles also is committing to spend $266 million in surrounding communities for sound insulation, environmental mitigation and similar projects. The agreement also would create a public process to revisit certain controversial aspects of the Master Plan such as the proposed ground transportation center. On December 12, 2005, the U.S. Environmental Protection Agency (EPA) released a draft rule that would exempt airport operators from the requirement to provide certain secondary containment for fuel trucks and similar vehicles. The current regulations, contained in the Spill Prevention, Control and Countermeasure Rule (40 C.F.R. Part 112), require airport operators to provide a secondary means to contain the capacity of the largest single compartment or container of a refueling vehicle. This can be accomplished through, for example, dikes or catchment basins. The airport industry advised that this requirement was unrealistic given the operating conditions at airports, potentially contrary to other regulatory requirements, and poses a threat to safety and security. In light of these concerns, the EPA has proposed to exempt mobile refuelers from this secondary containment requirement but not other elements of the SPCC Rule. In particular, airport operators still must provide passive or active containment or diversion to prevent leaks beyond the containment system. Airports also must regularly test the integrity of mobile refuelers. On December 21, 2005, EPA published a proposed rule that would tighten the standards for allowable levels of particulate matter in the ambient air. EPA most recently tightened the particulate standards in 1999 but only recently (in December 2004) designated nonattainment areas for the standard. EPA’s action in 2004 had the effect of subjecting a number of additional airports to general conformity and other requirements. If issued, the proposed tighter standards could increase the number of areas that would be in nonattainment status for particulate matter and thus the number of airports facing these conformity and other requirements. Under a consent decree, EPA must issue a final particulate standard by September 2006. It is taking comments from the public on the proposed rule for 90 days. The Clean Air Act requires the EPA to set ambient air quality standards at levels requisite to protect public health and reevaluate these standards periodically to account for new information about the heath effects and other aspects of air pollutants. The EPA map on the next page shows areas that may be in nonattainment status if the new standards are adopted. GA Security. On December 15, 2005, the Congressional Research Service released a report entitled “Securing General Aviation.” The report does not include conclusions or recommendations but contains a comprehensive review of the subject of general aviation security, including a thorough examination of the various alternatives proposed to address known and perceived threats. Environmental Regulations. On December 20, 2005, the FAA published a proposal to revise portions of FAA Order 1050.1E, Environmental Impacts: Policies and Procedures. The proposed revisions are designed primarily for clarification and consistency. Property Purchases for Noise. In September 2005, the Department of Transportation Office of Inspector General released a report criticizing airport compliance with requirements governing the use and sale of property purchased for noise mitigation purposes. While the report only addressed eleven airports, it is an important reminder to the FAA and airports of the stringent requirements for selling property and using sale proceeds. Proprietary Exclusive Right. Review is underway in the U.S. Court of Appeals on the FAA’s “proprietary exclusive right” by which many airports around the country provide fuel and other aeronautical services on an exclusive basis. A petition for review was filed in September 2005 by an FBO at Naples Municipal Airport who had lost its challenge before the FAA on the Airport Authority’s exclusive right to sell fuel. The FBO’s appeal alleges that the federal laws prohibiting exclusive rights cover the airport as well as FBOs. If accepted, this would eliminate the exception for airports recognized by the FAA for more than 30 years. ACI-NA has filed an amicus brief in support of the FAA’s decision.